Commuting is rarely fun. That is, unless you’re catching a train from Grand Central Terminal, which happens to be located just a four-block walk from the Royalton Hotel. Grand Central was built in 1871, at the beginning of the railroad boom. It started out as a large station known as the Grand Central Depot. But with railroad traffic increasing exponentially over the next few decades, it soon became evident that there was nothing “grand” or even practical about it. However, the Vanderbilt family stepped in and helped turn an insufficient train depot into a majestic structure that has been greeting and wowing arrivals to New York since the early 1900s. 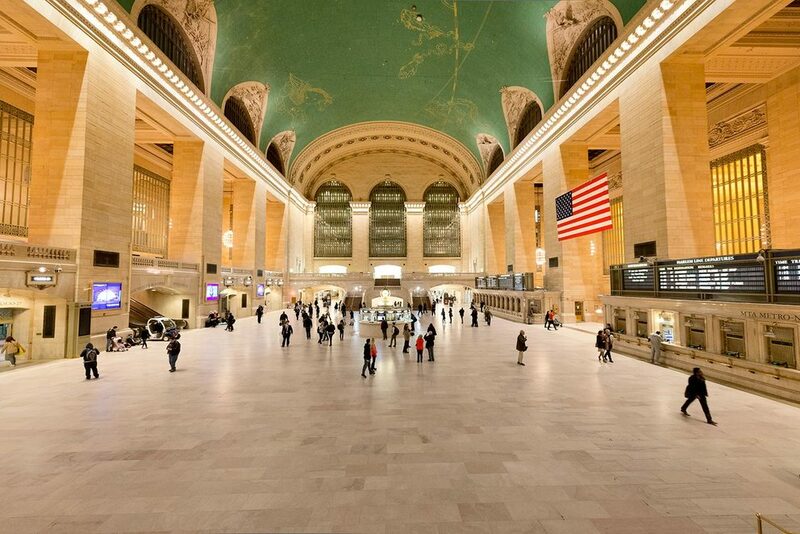 The facade and the Main Concourse are Grand Central’s most recognizable sights. The facade is inspired by Greek architecture and sculptures gods Mercury, Hercules, and Minerva guard the entrance and surround the Tiffany Clock. A good photo opportunity is the corner of 42nd St and Vanderbilt Avenue. Stepping inside is always an other-worldly experience - the Main Concourse’s ceiling is reminiscent of a great cathedral, while the Zodiac signs and constellations are a tribute to art and science. One can spend hours looking up, taking photos (no tripods allowed) and just gawking at the beauty of it all. Since you might get in the way of real commuters, climb the stairs of the Main Concourse to get better views and Instagram-worthy shots or walk to the information kiosk to take a good look at Grand Central’s iconic clock. The Whispering Gallery is an intriguing place - its structure creates an interesting effect: when you whisper into a corner, someone standing at the opposite corner will hear you loud and clear. Once you pull yourself away from the main attraction, you might be surprised of how much there is to see and do in Grand Central. Consider taking an audio or guided tour to delve deep into the terminal’s hidden treasures and snippets of history. Grand Central is comprised of many levels - shops, restaurants and cafés have turned part of the terminal into a shopping mall that caters to all tastes and budgets. We recommend heading to the sophisticated Campbell Bar to grab a drink and indulge in some fine dining. Or go to Grand Central Market to find some local produce and gourmet food. Events come and go year round - consult the calendar to see when it’s a good time to visit. The Annual Holiday Train Show is an all-time favorite. Every day from 5:30am to 2am. Consult stores and restaurant for individual opening hours. Walk four blocks to reach 42nd St and Park Avenue. What else can we say? The Royalton matches Grand Central in grandeur, plus it truly is in the heart of New York City. By staying with us, you’ll get expertly decorated rooms, in-house dining and drinking options and sweet deals with each stay.